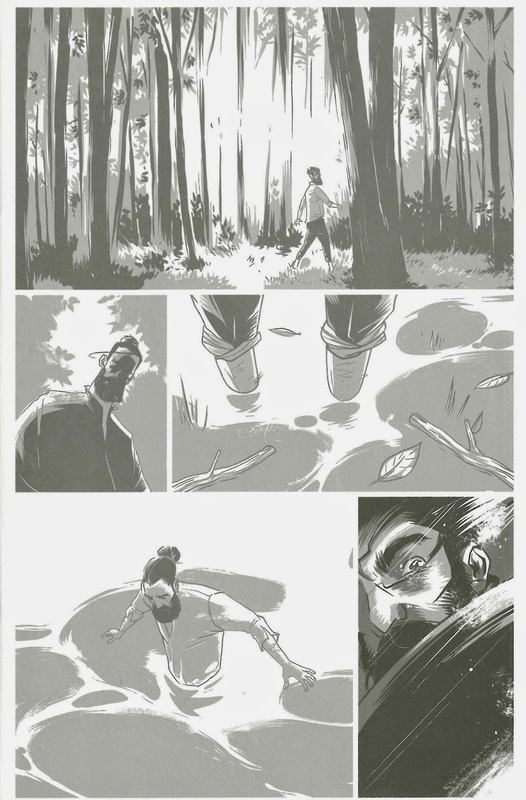 Two fine, fine comics to discuss with you today, both of which are so gorgeous looking that instead of the usual couple of smaller sized pictures, I've included 3 pages of each to illustrate, made the images large, and given them some space to breathe and shine. 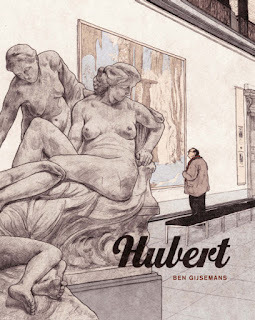 Good art soothes the eyes, and we are talking comics after all - the more illustrations the better. I've also opened both books up and scanned in the full, front and back covers as they both feature fantastic wraparound images and it's a shame not to present them in their full glory- staples and all. Queue by Dilraj Mann: 'Delilah from four perspectives' says the description for Queue on Dilraj Mann's site. And indeed that's what you get: a comic split into four chapters, told from the perspective of four individual characters over the course of one day/night in which their timelines unwittingly overlap. The only common thread of these stories is the running appearance of Delilah. Delilah, who has some kind of relationship with each person here, who you get to see and build an image of through the eyes of four different people, but never her version of events, from her own perspective. 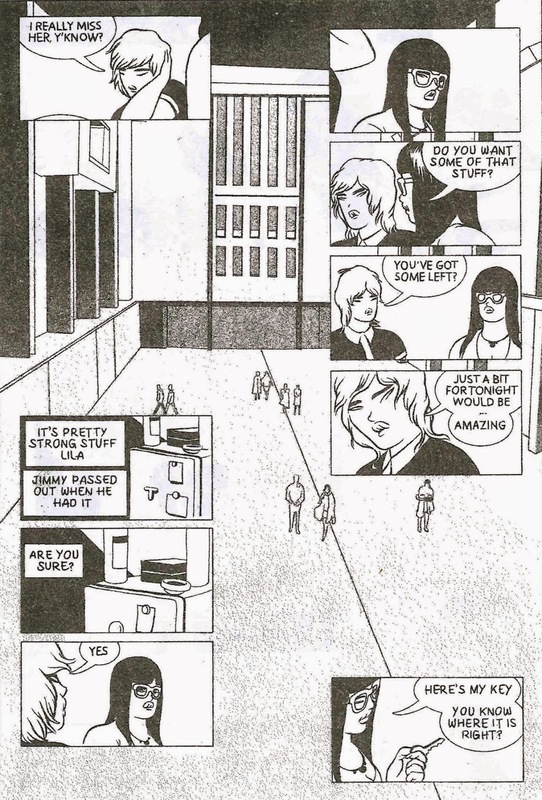 Each chapter begins with the same anchoring panel of the four stood in a queue outside a nightclub, with one character resuming the story from where the other left off, or from earlier in the day, revealing their role in the narrative. Delilah's been dumped by her girlfriend Nadia after Nadia found her in bed with someone else, and is still smarting from the hurt of the broken relationship. The stories and events, told in a loop by the characters here, hint at the parallel narrative of Delilah and Nadia's relationship, with the roles reversed. We see her as an object of instant infatuation, desirability, hooking up and using people to hurt others, selfish and narcissistic, but also as a friend, and the used, hurt party. The night ends with Delilah bumping into her ex, and in meeting Nadia we meet Delilah 2.0 or once removed, although both seem incapable of recognising their reflection in the other. 'What's in a name?' the Bard queried, and there is plentiful meaning in Mann's choice of Delilah, from the definition of 'she who weakened,' to the Biblical associations of the beautiful temptress who was Samson's downfall, betraying him for money. Milton, as he was wont to do, portrayed her in a more favorable light as a misguided but sympathetic figure, while in Tom Jones' murder ballad she's again the cheating, unfaithful woman, the object of obsession, paying for her 'sin' with her life. 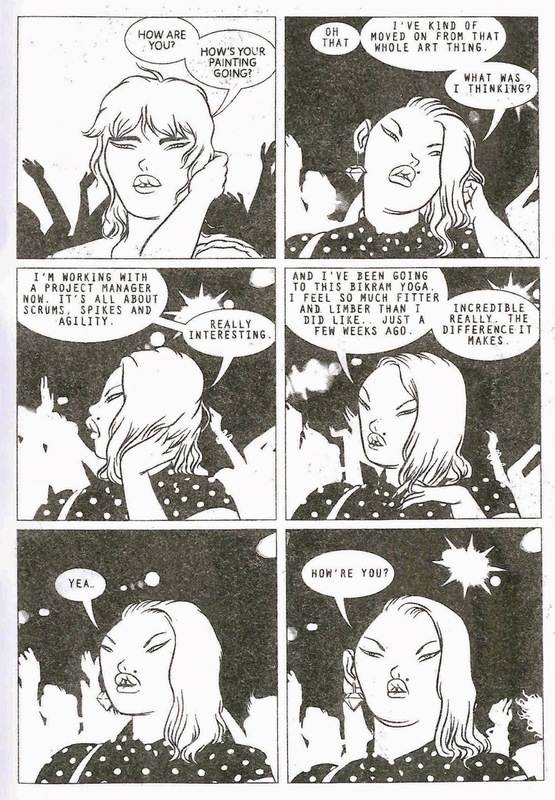 Mann's portrayal speaks to a number of these whilst refraining from trying to explain or justify Delilah, who she is is and why she does what she does. By doing so, he simultaneously allows her to retain her 'myth' and also question the need to provide motivation for her being any particular way. The sum of a person, their character, is rarely gauged from the glimpses we get of them, so to what purpose are assumptions and judgments made on that basis. Here, viewed through the eyes of four women, Delilah gets to be more of a person: multi-faceted, feminie, sexual, flawed, without capitulating to a desire to be unpacked. 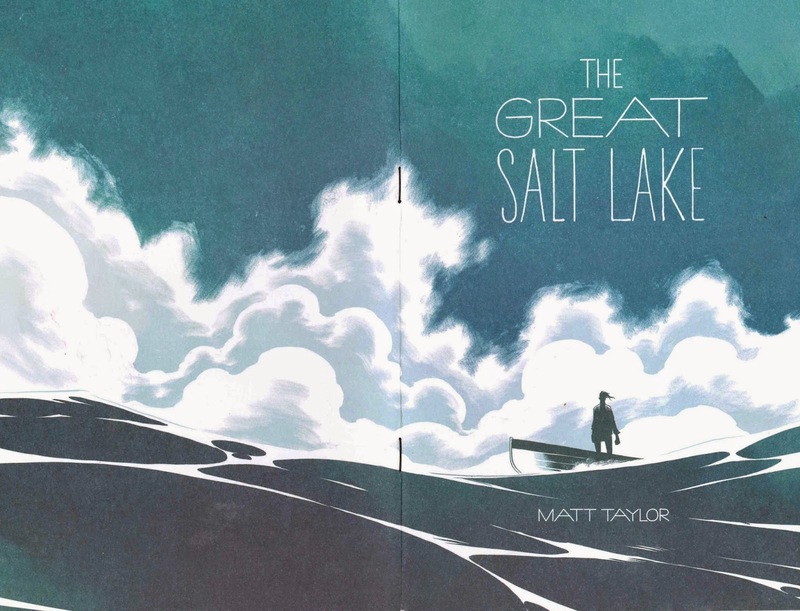 The Great Salt Lake by Matt Taylor: The shining beacon of The Great Salt Lake's attributes is Matt Taylor's sublime art, heralded in the fiercely beautiful opening panel of a burning ship in which smoke, flame, sky and sea whorl together. 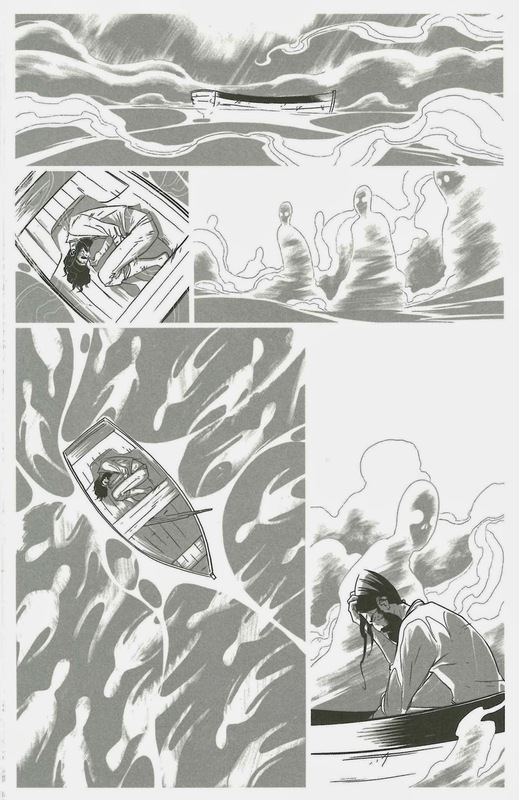 A lone survivor finds himself in a small boat adrift in the vastness of the ocean, his determination to find a way back to land steeled by memories of his wife to whom he promised to return. Man against ocean, or man against nature, even man against fate, is perhaps the oldest, most prevalent battle of them all. And yet what hope of triumph against such emblems? The shipwrecked sailor floats on, his strength and energy depleting as skeletal specters and hands reach up from the waves eager to claim him, the image of his wife sustaining him, driving him to paddle harder, to hold on. At every turn, there are mermaids, sirens, demonic manifestations, silently waiting ghosts ready to encompass him. Onwards he presses, as mind and memory blur and the separation between reality and hallucination becomes indeterminate, as cloud and sea swirl ever closer from above and below. Taylor brings the sea to such vivid life here, reinforcing the otherworldly power and magnificence of the ocean without compromising on the dangers it possesses for man. Someone remarked recently that the sea isn't shark-infested- that's where sharks belong, it's their home- the sea is human-infested when we venture into it. I thought that was a telling attitude in how we discuss nature at large: in relation to us, our appropriation of it as as useful or decorative, or something to be dominated and conquered. 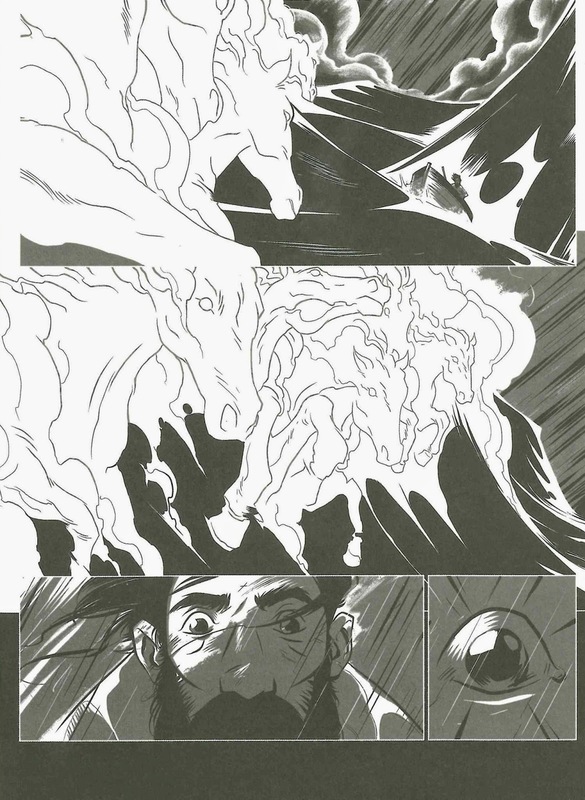 Taylor is a talented illustrator and designer, and this is his first comic and it's masterfully assured. While the narrative may not sound like anything new, it's dependent on the manner in which its executed and what new life Taylor can offer it through his art, which is the backbone of this book. The greens and blues of that cover are simply wonderful as is the texture of the clouds as they bulb and wisp from the horizon. Throughout the book, Taylor's uses blacks beautifully, to cast ominous shadows, to apply jagged depth to rocks, to give body to the swell of water. The thunderous waves fashioned into huge galloping frothy horses will instantly bring to mind that 90's Guinness advert for some, but it's an exceptional piece of work to reference -deliberately or otherwise- and the imagery is still resonant and fresh. The rendering of light is superb, particularly in the flashback scenes on land where he relies on greys and whites to convey dappled sunshine streaming through tress and leaves. Castaway stories are often a metaphor for being adrift at some point in life -moorless, without direction- and looking for comfort or shore, as we work against a tide of obstacles and Taylor's narrative allows for an easy interweaving of those themes along with the primary reading of a man searching for the steadfastness of the one thing he holds most dear. Alone he is besieged by the howling disquiet of nature's majestic, monstrous inevitability. What do we have if not a belief in something -perhaps one thing- that keeps us sane? If that's what you need to survive, to live, as the reason to stave off death, then who would begrudge it. And so, with death at his back, the man bends the last of his will to search for the comfort of the path he knows. 'Au fond tout va bien' indeed. *Just a note if you were interested in buying this (you can find the link to the store in the title up there): Taylor's sold half his print run already and won't be reprinting in this format, so it may be better to invest sooner rather than later.